Use the healing power of music to nourish and heal yourself and others. Training in therapeutic music history and practice for vocalists and acoustic instrumentalists. Training in utilizing the physical vibrations of the sound of a harp in a therapeutic way. Preparing musicians for playing in the public areas of a medical environment - lobbies, nurse's stations, care centers, and the like. What is therapeutic music and why is training necessary? Therapeutic music is live music played in a therapeutic manner to match the immediate needs of a patient/client. A trained therapeutic musician will adapt the style of music being played to help a person find a place of healing and peace. 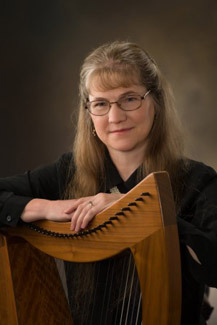 The training offered through Harp for Healing LLC will provide insight into how to adapt music to meet the needs of people in healthcare environments. Public Music for Medical Environments (PMME)--training in appropriate music for public areas of healthcare environments, such as lobbies, nurse's stations, hallways, and the like. Clinical Musician Certification Program (CMCP)--training in the theory and practice of bedside therapeutic music. Accredited by the National Standards Board for Therapeutic Music (NSBTM). Suitable for any therapeutic instrument--harp, keyboard, guitar, voice, dulcimer, etc. Vibroacoustic Harp Therapy Training Program (VAHT)--training in the practice of Vibroacoustic Harp Therapy, offered through agreement with Musiatry, LLC.